Some of the nation’s largest insurance companies might acquire senior living providers in the years ahead, in a quest to more effectively manage the health and wellness of their Medicare Advantage (MA) beneficiaries and keep costs in check. That was an idea floated Tuesday by Eclipse Senior Living CEO Kai Hsiao and former U.S. Health and Human Services Secretary Mike Leavitt. Both men spoke at the annual conference of senior living industry association Argentum, in San Antonio. The last year has been a watershed period for Medicare Advantage in senior living, and as the predictions from Hsiao and Leavitt indicate, the future of the industry could be closely tied to the private sector insurance companies that run these plans — making it imperative for providers to start considering potential business strategies with this in mind. In April 2018, the Centers for Medicare & Medicaid Services (CMS) finalized a policy allowing MA plans to cover certain non-skilled in-home care as supplemental benefits, paving the way for Medicare Advantage to become a payer for senior living services. In Medicare Advantage, private sector insurance companies receive capitated payments from the federal government to provide alternative plans to traditional fee-for-service Medicare. In the wake of last April’s policy change, several insurers that offer MA plans — including Anthem and SCAN — expressed a willingness to work more closely with senior living providers. On Tuesday, Louisville-based Humana joined this list. “In the senior living space, there’s opportunity for conversations,” said Mike Funk, director of national networks at Humana. Humana has evolved over the last six or seven years, he explained. Previously, the company placed a heavy emphasis on primary care, but now it is focused on value-based arrangements that largely revolve around reaching beneficiaries in their homes. In one example of this shift, Humana determined that many of its plan members were being readmitted to the hospital because they lacked access to nutritious food after returning home. The company realized that paying for food rather than hospitalizations could drive cost savings and increase customer satisfaction, Funk said. As some in the industry have already noted, senior living providers might be especially well-positioned to address the so-called social determinants of health — such as access to healthy food — that help older adults maintain their wellness, control chronic conditions and avoid costly medical interventions. Senior living providers should gather data showing the value that they bring on this front and present that to Medicare Advantage companies that they are interested in working with, Funk advised. “From a payer perspective, they might not have anything to offer you now, but you’ve planted the seed,” he said. Underscoring how serious Humana is about reaching seniors in their homes, the company acquired an ownership stake in the nation’s largest home health care provider, Kindred at Home, in a $4.1 billion transaction announced in late 2017. The insurance company followed that up with a $1.4 billion deal to acquire a stake in hospice provider Curo. This type of vertical alignment of payer and provider to closely manage a population of patients/beneficiaries could be a foreshadowing of things to come in senior living, Leavitt and Hsiao suggested, although neither said that Humana specifically would be likely to pursue it. This alignment between insurers and senior living is already the norm in China and Europe, he added. “As [insurers] begin to look at these new regulations and say that’s a pretty interesting market over there, there’s all that private payment, they’re not as highly regulated, I bet their margins might be better than ours … they have a lot of capital and a lot of interest in being able to create integration,” he said. 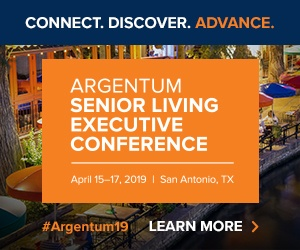 While insurance companies are now expressing interest in senior living, it has in fact been challenging to gain the attention of managed care organizations, Sunrise Senior Living CEO Chris Winkle said on Tuesday at Argentum. This was one of the main reasons why McLean, Virginia-based Sunrise — one of the largest providers in the nation — decided to start its own Medicare Advantage plan. Some within the company expressed doubts about the idea, noting that Sunrise is almost entirely private pay and that Medicare Advantage margins are much thinner, Winkle said. However, nearly all of Sunrise’s residents are Medicare beneficiaries, and with the focus on social determinants bringing managed care ever closer to senior living, Sunrise ultimately decided that it needed to move forward with an MA plan and control its own destiny. Given current trends, there is a possibility that senior living providers might “wake up one day” and find that there are multiple managed care organizations essentially dictating how their communities are to be run, Winkle said. Sunrise is trying to defend against this by running its own plan. Other senior living providers are making similar calculations. For example, The Perennial Consortium is a group of providers that has come together to launch their own Medicare Advantage plans. The effort was spearheaded by Lynne Katzmann, CEO of Bloomfield, New Jersey-based Juniper Communities. Like Winkle, she has said that it’s important for senior living providers to prove their value so that they have leverage should large insurance companies try to increase their sway over the industry in the future. Responding to Hsiao’s comments on Tuesday, Katzmann did not go so far as to agree that a large Medicare Advantage insurer will acquire a sizable senior living provider, although she believes that insurance companies are certainly weighing their options. While starting an MA plan is one strategy for senior living providers to pursue, it is not for the faint of heart. Launching a plan is a complex undertaking, and successful plans typically have margins of around 3% to 4%. But if starting a plan is not realistic for many senior living providers, the alternative cannot be ignoring Medicare Advantage altogether, warned Winkle and Leavitt. Rather, senior living providers should engage with the insurance companies in their markets, explore options for mutually beneficial business arrangements, and be prepared for a new normal. “My advice to everyone in the audience is, we shouldn’t think that things aren’t going to change,” Winkle said.